A little effort early in the process will help you avoid disputes with your neighbors when you install a new fence. If you’re a part of an HOA or bound by similar neighborhood rules, be sure your planned new fence installation meets the regulations for fencing. This can go a long way in preventing future neighbor disputes, since they also agreed to those same rules. There may even be by-laws to help you handle a neighbor dispute. It’s important when you install new fencing that you make sure you know your property line. This is a leading cause for neighbor disputes over new fences. Hiring a surveyor may cost a few hundred dollars, but it will be cheaper than tearing down and replacing a new fence that crosses onto your neighbor’s property. Your fence will have effects beyond your own property. A neighbor dispute over a new fence could cause years of stress. But a high-quality fence from Freedom Fence and Home could provide benefits for you and your friends next door. In some cases, neighbors may agree to split the cost of a new fence if it’s mutually beneficial. 1. Choose a classic design that matches your home and neighborhood. You and your neighbor will both be happy, and you’ll have a greater return on your investment. 2. The unfinished or less attractive side of the fence should face inwards, and the more attractive side should face outwards. Of course, for many fences this won’t be a problem because the two sides are identical. 3. Take care of both sides of your fence. If you’re concerned about the maintenance, go with an easy-to-clean material like vinyl or aluminum instead of wood, which requires a lot of clean-up, staining, and sealing. 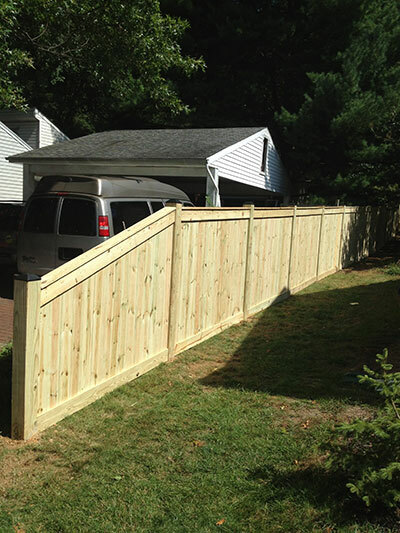 If you have questions about installing a new fence, or for a free estimate, visit our website or give us a call today at 443-271-6841. This entry was posted on Thursday, March 24th, 2016	at 10:46 am	. Both comments and pings are currently closed.